What Are The Consequences For Not Complying With New ELD Mandate? The path to full implementation of the federal government’s new electronic logging device (ELD) mandate may be riddled with some unexpected twists and turns and assorted road hazards, such as legal challenges and legislative tweaking. But by the end of 2017 all commercial fleets and drivers in the United States will have to install the devices in their trucks. And if they don’t, what happens? To paraphrase a not-so-ancient adage: There will be the federal government to pay. In other words, federal officials have instituted penalties for non-compliance with the new mandate. We at ABCO Transportation are publishing a series on the mandate and how the rule affects the industry. This week’s question is: What are the consequences for not complying? More than seven years in the making and sidelined for a time after an earlier unsuccessful legal challenge, the ELD mandate was entered into the federal register in late December 2015. Full implementation is set for December 2017, a two-year window to allow fleets and owner operators to get acquainted with the 800-page mandate’s provisions and to begin the process of equipping their vehicles. The Owner-Operator Independent Drivers Association (OOIDA) has attempted to block implementation of the mandate by filing an appeal with the Seventh Circuit of Appeals in Chicago. Oral arguments were heard last month and legal experts predict a ruling by later this year or January 2017. OOIDA argue the mandate violates drivers’ constitutional rights to privacy and against illegal searches and seizures. Industry expert Annette Sandberg discussed the mandate at length with fleet leaders at a conference by FleetOwner, an online information source for fleet leaders. Sandberg was administrator for the Federal Motor Carrier Safety Administration (FMCSA). The FMCSA puts failure by motor carriers and drivers to comply with the mandate’s requirements in the same category as all other non-compliance traffic offenses, according to Sandberg. Penalties are determined by fleets’ or drivers’ level of intent in not complying, responsibility in the violation and history of previous offenses. Federal statutes require judges to consider those factors before instituting a civil penalty. FMSCA rules consider disabling, deactivating or tampering with an ELD an acute violation, considered a severe civil violation. Acute violations require immediate corrective action, according to the FMSCA. Critical violations carry less severe penalties and include failure to require drivers to file a record of duty status, for example. The FMSCA uses formulas to calculate fines for violators. The initial calculated fine per acute violation is $8,672, according to FMSCA. Those who contract with transportation companies will want to make sure the companies are in compliance with the new ELD mandate. 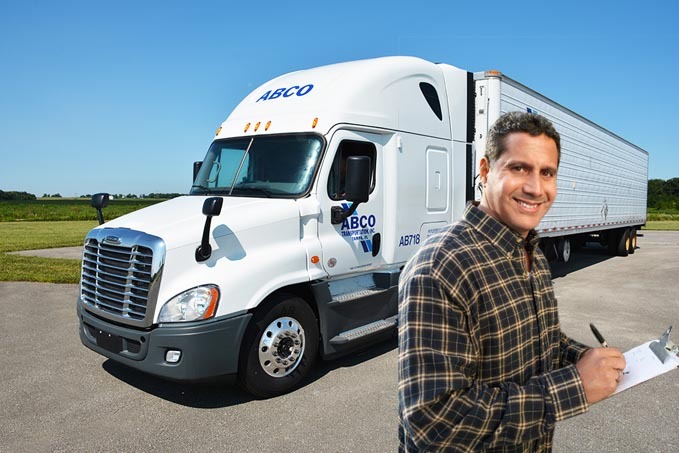 ABCO Transportation is already in compliance, as the latest ELD technology is already installed in each of our trucks. Looking for the best trucking company to help manage your shipping needs? Contact us today.